COFFEE TABLES CONSTRUCTED OF STEEL AND GLASS. 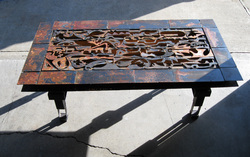 THIS TABLE CAN BE EASILY TAKEN APART TO REVEAL THE WOODEN INSERT, DECORATIVE GRILL FOR A VARIETY OF LOOKS. IT COULD ALSO HAVE A SLEEK LOOK WITH A PLATE GLASS TOP AND THE EMPTY CENTRAL PORTION OF THE TABLE. 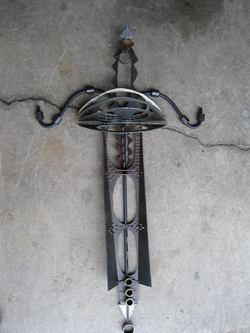 THIS INDUSTRIAL DESIGN WOULD BE RIGHT AT HOME IN A LOFT OR GARDEN ROOM. THIS CUBE TABLE GIVES A NOD TO FURNITURE MAKER PAUL EVANS WHO ACTUALLY WAS AT RIT FOR 2 YEARS IN THE 1970'S. TEXTURED GLASS TOP ALLOWS LIGHT TO FLOW INTO THE CUBE BODY OF THIS TABLE. DESIGN ELEMENTS ARE INTERPRETATIONS OF PAUL EVANS BRUTALIST STYLE OF FURNITURE MAKING. 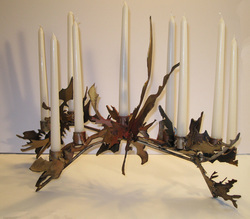 HE WORKED IN WOOD, BUT EMPLOYED A WELDER TO CREATE THE METAL DETAILS, FOR WHICH IS IS KNOWN FOR! EACH PIECE IS MADE FROM THE CUT OUT PIECES LEFT OVER FROM PROJECTS AND ARE A ONE OF A KIND WORK. TABLE TOP LANTERN WITH RE-MOVEABLE TOP. CUT IN THE STYLE OF PAUL EVANS, THESE LAMPS ADD DRAMA TO ANY AREA IN THE ROOM. RUSTIC COLORS ARE ACCENTED WITH METAL COLORED GILDERSPASTE ON THE SURFACE. 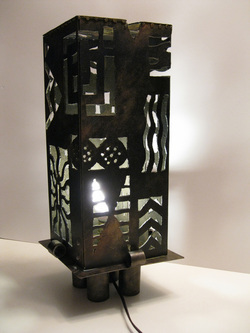 WILL TAKE VERY TALL, LARGE LIGHT BULB UP TO 120 W.
AGAIN, USING LEFT OVER PIECES AND RECYCLED STEEL, AFRICAN INSPIRED MASKS OFFER AN UNCLUTTERED DESIGN TO ANY WALL. LEFT AS NATURAL STEEL WITHOUT COLOR TO ENHANCE FORM AND SURFACE.